On the third afternoon of the cruise, I went to a seminar on Windstar given by my friend and the Windstar BDM for about an hour. The presentation was standard promotional fare-on the ships, itinerary, etc. About 20 of us travel agents onboard attended (sort of had to for paying a substantially reduced fare for the cruise). It was uneventful and prizes we're given out, like Windstar caps, t-shirts, etc. About an hour after the presentation, the mandatory parts we're over, and the vast majority of the ta crowd left to do something else. Around 5 of us we're left discussing optional topics like groups, etc. At this point, one of the ship's junior officers came into the room, and asked us if we wanted to sit at the captain's table for dinner. Of course we jumped at the chance. Most of us had never had such an offer, as we had pretty much only sailed on big ships from big cruise lines before, where despite the Love Boat, the captain never dines in the main dining room, and we had never received such an offer. We had about 1/2 an hour to freshen up, and I put on a long-sleeve shirt and khakis, and at the appointed time and place (we we're instructed by the junior officer where to meet the captain), I went out and met my friend and a few others-and this is where I learned I was dramatically underdressed. An older 50 ish man in our group to sit at the table, and ran a business with his wife and adult daughter, came out in a suit. While I didn't have a suit, I did have a blazer and dress shirt, so I hurridly ran back to my cabin (just 5 rooms down the hall from where we we're), and changed, and came back out. 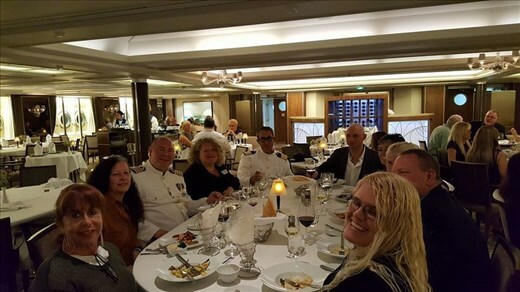 With all of us there, we waited about 10 minutes, and the captain and hotel director came down and led us to our table in the middle of the dining room, with many of the other diners looking at us (jealously I believe). The service, which was always good, was better of course, and on this evening, the wine flowed freely. The captain was just like Captain Stubin-it Captain Stubin was a bit paunchy and spoke with a heavy Scottish Brouge. We talked about him and his 6 year old daughter, and other topics, as where he had been I was sitted next to the middle aged Greek hotel director, and we spoke a little about his experiences (I believe he worked for Celebrity before). As usual the conversation with me was fitful, but it was a nice time-the food was good-and the wine flowed. After that, the crowed disperesed and I went and watched the entertainment with some of the othes.